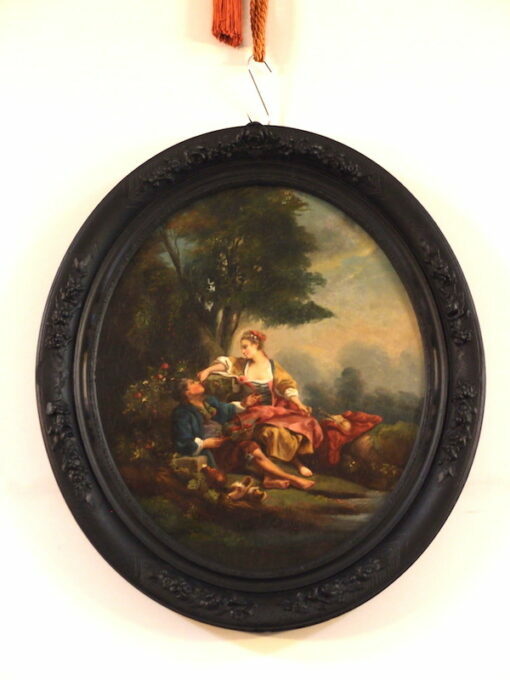 This oil on canvas painting on a 45 cm by 54 cm oval stretcher is a late 18th century work after Francois Boucher's painting, "Le Sabots" of 1768 ( see "man on the right" painting). 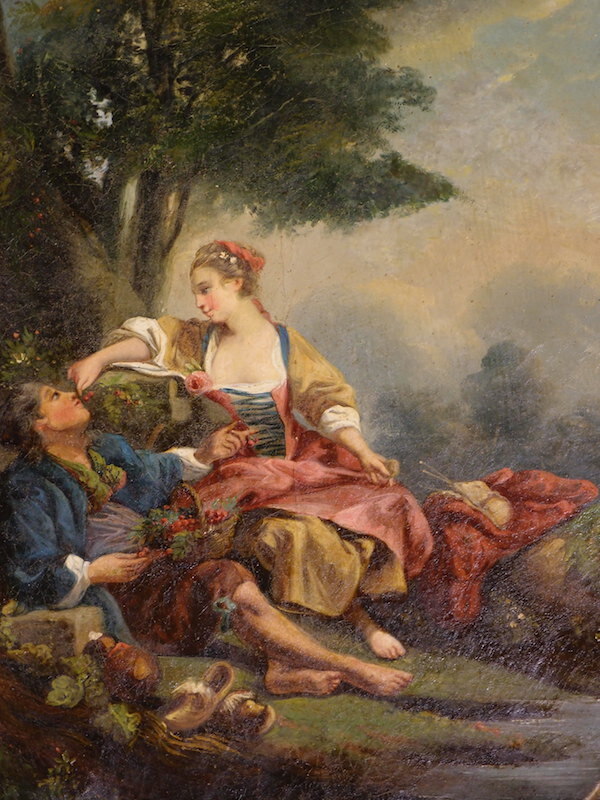 However, it is a mirror image of the original Boucher composition, with the man on the left of the woman. The painting may have been based on the print made by Rene Gaillard (C1719-1750), whose etchings and engravings of Boucher's paintings inhabit many galleries and museums across the world, the Metropolitan (NY) and the NGV, being two. Francois Boucher (1703-1770) became first painter to the Louis XV as well as head of the Royal Academy, and was vastly influential in promoting the Rococo style. "Le Sabots" is named for the wooden clogs in the foreground. A couple sits in pastoral serenity sharing rasberries and flirtation. Her knitting and shawl lies on a rock nearby. The original is in the Art Gallery of Ontario. Our painting comes with a 19th century frame, now ebonised. Even if we had the required millions of dollars to buy the original, I suspect the gallery will not give it up, but our good antique copy captures much of the vivaciousness of the Ontario painting. 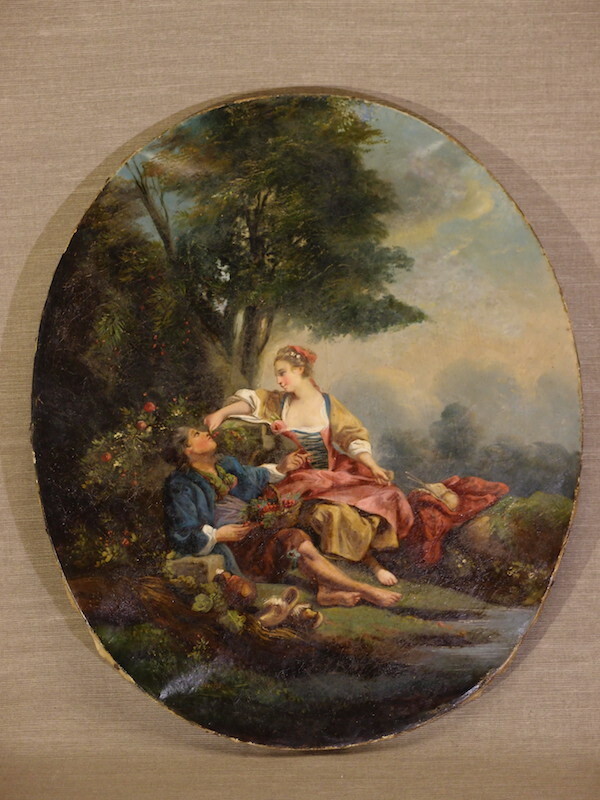 This oil on canvas painting on a 45 cm by 54 cm oval stretcher is a late 18th century work after Francois Boucher’s painting, “Le Sabots” of 1768 ( see “man on the right” painting). However, it is a mirror image of the original Boucher composition, with the man on the left of the woman. The painting may have been based on the print made by Rene Gaillard (C1719-1750), whose etchings and engravings of Boucher’s paintings inhabit many galleries and museums across the world, the Metropolitan (NY) and the NGV, being two. “Le Sabots” is named for the wooden clogs in the foreground. A couple sits in pastoral serenity sharing rasberries and flirtation. Her knitting and shawl lies on a rock nearby. The original is in the Art Gallery of Ontario. Our painting comes with a 19th century frame, now ebonised. Even if we had the required millions of dollars to buy the original, I suspect the gallery will not give it up, but our good antique copy captures much of the vivaciousness of the Ontario painting.